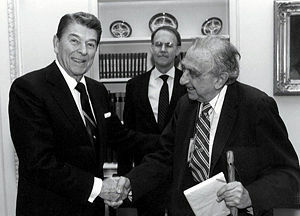 Edward Teller (original Hungarian name Teller Ede) (January 15, 1908 – September 9, 2003) was a Hungarian-born American theoretical physicist, known colloquially as "the father of the hydrogen bomb," even though he did not care for the title. Teller emigrated to the United States in the 1930s, and was an early member of the Manhattan Project charged with developing the first atomic bombs. During this time, he made a serious push to develop the first fusion-based weapons as well, but these were deferred until after World War II. After his controversial testimony in the security clearance hearing of his former Los Alamos colleague, Robert Oppenheimer, Teller became ostracized from much of the scientific community. He continued to find support from the U.S. government and military research establishment. He was a co-founder of Lawrence Livermore National Laboratory, and was both its director and associate director for many years. In his later years, he became especially known for his advocacy of controversial technological solutions to both military and civilian problems, including a plan to excavate an artificial harbor in Alaska using thermonuclear explosives. He was an avid advocate of Ronald Reagan's Strategic Defense Initiative, perhaps overselling the feasibility of the program. Over the course of his life, Teller was known both for his scientific ability and his difficult interpersonal relations and volatile personality, and is considered one of the inspirations for the character, Dr. Strangelove, in the 1964 movie of the same name. Teller was born in Budapest, Austria-Hungary, to a Jewish family. He left Hungary in 1926 (partly due to the Numerus clausus rule under Horthy's regime). The political climate and revolutions in Hungary during his youth instilled in him a deep hatred for both Communism and Fascism. When he was a young student, his leg was severed in a streetcar accident in Munich, requiring him to wear a prosthetic foot and leaving him with a life-long limp. Teller graduated in chemical engineering at the University of Karlsruhe and received his Ph.D. in physics under Werner Heisenberg at the University of Leipzig. Teller's Ph.D. dissertation dealt with one of the first accurate quantum mechanical treatments of the hydrogen molecular ion. In 1930, he befriended Russian physicists George Gamow and Lev Landau. Very important for Teller's scientific and philosophical development was his life-long close friendship with Czech physicist, George Placzek. It was Placzek who arranged for young Teller a summer stay in Rome with Enrico Fermi and oriented his scientific career to nuclear physics. He spent two years at the University of Göttingen and left Germany in 1933, through the aid of the Jewish Rescue Committee. He went briefly to England and moved for a year to Copenhagen, where he worked under Niels Bohr. In February 1934, he married "Mici" (Augusta Maria) Harkanyi, the sister of a longtime friend. Teller as a young boy. In 1935, thanks to George Gamow's incentive, Teller was invited to the United States to become a Professor of Physics at the George Washington University, where he worked with Gamow until 1941. Prior to the discovery of fission in 1939, Teller was engaged as a theoretical physicist working in the fields of quantum, molecular, and nuclear physics. In 1941, after becoming a naturalized citizen of the United States, his interest turned to the use of nuclear energy, both fusion and fission. At GWU, Teller predicted the Jahn-Teller Effect (1937), which distorts molecules in certain situations; this particularly affects the chemical reactions of metals, and in particular the coloration of certain metallic dyes. Teller and Hermann Arthur Jahn analyzed it as a piece of purely mathematical physics. In collaboration with Brunauer and Emmet, Teller also made an important contribution to surface physics and chemistry; the so-called Brunauer-Emmett-Teller (BET) isotherm. When World War II began, Teller wanted to contribute to the war effort. On the advice of the well-known Caltech aerodynamicist and fellow Hungarian émigré, Theodore von Kármán, Teller collaborated with his friend Hans Bethe in developing a theory of shock-wave propagation. In later years, their explanation of the behavior of the gas behind such a wave proved valuable to scientists who were studying missile re-entry. In 1942, Teller was invited to be part of Robert Oppenheimer's summer planning seminar at UC Berkeley for the origins of the Manhattan Project, the Allied effort to develop the first nuclear weapons. A few weeks earlier, Teller had been meeting with his friend and colleague, Enrico Fermi, about the prospects of atomic warfare, and Fermi had nonchalantly suggested that perhaps a weapon based on nuclear fission could be used to set off an even larger nuclear fusion reaction. Even though he initially quickly explained to Fermi why he thought the idea wouldn't work, Teller was fascinated by the possibility and was quickly bored with the idea of "just" an atomic bomb (even though this was not yet anywhere near completion). At the Berkeley session, Teller diverted discussion from the fission weapon to the possibility of a fusion weapon—what he called the "Super" (an early version of what was later known as a hydrogen bomb). On December 6, 1941, the United States had begun development of the atomic bomb, under the supervision of Arthur Compton, chairman of the University of Chicago physics department, who coordinated uranium research with Columbia University, Princeton University, University of Chicago and University of California at Berkeley. Compton transferred Columbia and Princeton scientists to the Metallurgical Laboratory at Chicago. Enrico Fermi moved in at the end of April 1942, and the construction of a Chicago Pile 1 began. Teller was left behind at first, but then called to Chicago two months later. In early 1943, the Los Alamos laboratory was built to design an atomic bomb under the supervision of Oppenheimer in Los Alamos, New Mexico. Teller moved there in April 1943. 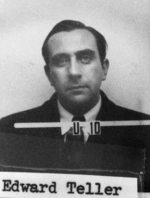 Teller's ID badge photo from Los Alamos. Teller became part of the Theoretical Physics division at the then-secret Los Alamos laboratory during the war, and continued to push his ideas for a fusion weapon even though it had been put on a low priority during the war (as the creation of a fission weapon was proving to be difficult enough by itself). Because of his interest in the H-bomb, and his frustration at having been passed over for director of the theoretical division (the job was instead given to Hans Bethe), Teller refused to engage in the calculations for the implosion of the fission bomb. This caused tensions with other researchers, as additional scientists had to be employed to do that work—including Klaus Fuchs, who later was revealed to be a Soviet spy. Apparently, Teller also managed to irk his neighbors by playing the piano late in the night. However, Teller also made some valuable contributions to bomb research, especially in the elucidation of the implosion mechanism. In 1946, Teller participated in a conference in which the properties of thermonuclear fuels such as deuterium and the possible design of a hydrogen bomb were discussed. It was concluded that Teller's assessment of a hydrogen bomb had been too favorable, and that both the quantity of deuterium needed, as well as the radiation losses during deuterium burning, would shed doubt on its workability. Addition of expensive tritium to the thermonuclear mixture would likely lower its ignition temperature, but even so, nobody knew at that time how much tritium would be needed, and whether even tritium addition would encourage heat propagation. At the end of the conference, in spite of opposition by some members such as Robert Serber, Teller submitted an unduly optimistic report in which he said that a hydrogen bomb was feasible, and that further work should be encouraged on its development. Fuchs had also participated in this conference, and transmitted this information to Moscow. The model of Teller's "classical Super" was so uncertain that Oppenheimer would later say that he wished the Russians were building their own hydrogen bomb based on that design, so that it would almost certainly retard their progress on it. In 1946, Teller left Los Alamos to go to the University of Chicago. 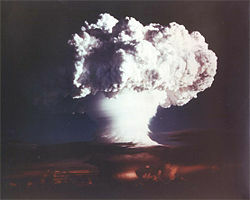 Following the Soviet Union's first test detonation of an atomic bomb in 1949, President Truman announced a crash development program for a hydrogen bomb. Teller returned to Los Alamos in 1950, to work on the project. Teller quickly grew impatient with the progress of the program, insisted on involving more theorists, and accused his colleagues of lacking imagination. This worsened his relations with other researchers. None of his designs (or anyone else's), however, were yet workable. Bethe thought that had Teller not pressed for an early H-bomb test, the Russians' own development might possibly have been slowed, particularly as the information Klaus Fuchs gave them contained many incorrect technical details that rendered a workable H-bomb infeasible. Russian scientists who had worked on the Soviet hydrogen bomb have claimed that they could see that the early ideas were infeasible as well as anyone else who had looked at them did, and also claimed that they developed their H-bomb wholly independently. The issue is controversial. Bethe spoke of Teller’s "stroke of genius" in the invention of the H-bomb as early as 1954. Other scientists (antagonistic to Teller, such as J. Carson Mark) have claimed that Teller would have never gotten any closer without the assistance of Ulam and others. The breakthrough—the details of which are still classified—was apparently the separation of the fission and fusion components of the weapons, and to use the radiation produced by the fission bomb to first compress the fusion fuel before igniting it. However, compression alone would not have been enough and the other crucial idea—staging the bomb by separating the primary and secondary—seems to have been exclusively contributed by Ulam. Also, Ulam's idea seems to have been to use mechanical shock from the primary to encourage fusion in the secondary, while Teller quickly realized that radiation from the primary would do the job much earlier and more efficiently. Some members of the laboratory (J. Carson Mark, in particular) later expressed that the idea to use the radiation would have eventually occurred to anyone working on the physical processes involved, and that the obvious reason why Teller thought of radiation right away was because he was already working on the "Greenhouse" tests for the spring of 1951, in which the effect of the energy from a fission bomb on a mixture of deuterium and tritium was going to be investigated. Whatever the actual components of the so-called Teller-Ulam design and the respective contributions of those who worked on it, after it was proposed, it was immediately seen by the scientists working on the project as the answer which had been so long sought. Those who previously had doubted whether a fission-fusion bomb would be feasible at all were converted into believing that it was only a matter of time before both the U.S. and the USSR had developed multi-megaton weapons. Even Oppenheimer, who was originally opposed to the project, called the idea "technically sweet." Though he had helped to come up with the design and had been a long-time proponent of the concept, Teller was not chosen to head the development project (his reputation of a thorny personality likely played a role in this). In 1952, he left Los Alamos and joined the newly established Livermore branch of the University of California Radiation Laboratory, which had been created largely through his urging. After the detonation of "Ivy Mike," the first thermonuclear weapon to utilize the Teller-Ulam configuration, on November 1, 1952, Teller became known in the press as the "father of the hydrogen bomb." Teller himself refrained from attending the test—he claimed not to feel welcome at the Pacific Proving Grounds—and instead saw its results on a seismograph in the basement of a hall in Berkeley. 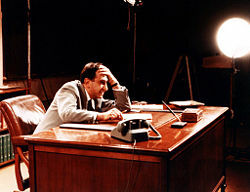 Many of Teller's colleagues were irritated that he seemed to enjoy taking full credit for something he had only a part in, and in response, with encouragement from Enrico Fermi, Teller authored an article titled "The Work of Many People," which appeared in Science magazine in February 1955, emphasizing that he was not alone in the weapon's development (he would later write in his memoirs that he had told a "white lie" in the 1955 article in order to "soothe ruffled feelings," and claimed full credit for the invention). Nobody blamed Teller because the calculations of 1946 were wrong, especially because adequate computing machines were not available at Los Alamos. But he was blamed at Los Alamos for leading the laboratory, and indeed the whole country, into an adventurous program on the basis of calculations, which he himself must have known to have been very incomplete. The rift between Teller and many of his colleagues was widened in 1954, when he testified against Robert Oppenheimer, former head of Los Alamos and member of the Atomic Energy Commission, at Oppenheimer's security clearance hearing. Teller had clashed with Oppenheimer many times at Los Alamos over issues relating both to fission and fusion research, and during Oppenheimer's trial he was the only member of the scientific community to label Oppenheimer a security risk. Teller was Director of the Lawrence Livermore National Laboratory (1958–1960), which he helped to found (along with Ernest O. Lawrence), and after that he continued as an Associate Director. He chaired the committee that founded the Space Sciences Laboratory at Berkeley. He also served concurrently as a Professor of Physics at the University of California, Berkeley. He was a tireless advocate of a strong nuclear program and argued for continued testing and development—in fact, he stepped down from the directorship of Livermore so that he could better lobby against the proposed test ban. He testified against the test ban both before Congress as well as on television. After the Oppenheimer controversy, Teller became ostracized by much of the scientific community, but for obvious reasons was still quite welcome in the government and military science circles. Along with his traditional advocacy for nuclear energy development, a strong nuclear arsenal, and a vigorous nuclear testing program, he had helped to develop nuclear reactor safety standards as the chair of the Reactor Safeguard Committee of the AEC in the late 1940s, and later headed an effort at General Atomics to design research reactors in which a nuclear meltdown would be theoretically impossible (the TRIGA). 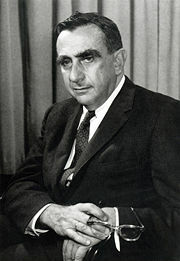 Teller established the Department of Applied Science at the University of California, Davis, and LLNL in 1963, which holds the Edward Teller endowed professorship in his honor. In 1975, he retired from both the lab and Berkeley, and was named Director Emeritus of the Livermore Laboratory and appointed Senior Research Fellow at the Hoover Institution. After the fall of communism in Hungary in 1989, he made several visits to his country of origin, and paid careful attention to the political changes there. Teller was one of the strongest and best-known advocates for investigating non-military uses of nuclear explosives, known as Operation Plowshare. 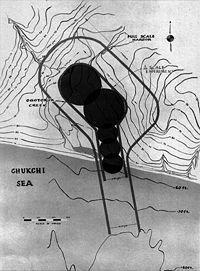 One of the most controversial projects he proposed was a plan to use a multi-megaton hydrogen bomb to dig a deep-water harbor more than a mile long and half a mile wide to use for shipment of resources from coal and oil fields near Point Hope, Alaska. The Atomic Energy Commission accepted Teller's proposal in 1958, and it was designated Project Chariot. While the AEC was scouting out the Alaskan site, and having withdrawn the land from the public domain, Teller publicly advocated the economic benefits of the plan, but was unable to convince local government leaders that the plan was financially viable. Other scientists criticized the project as being potentially unsafe for the local wildlife and the Inupiat people living near the designated area, who were not officially told of the plan until 1960. Additionally, it turned out that the harbor would be ice-bound for nine months out of the year. In the end, due to the financial infeasibility of the project and the concerns over radiation-related health issues, the project was canceled in 1962. A related experiment which also had Teller's endorsement was a plan to extract oil from the Athabasca oil sands in northern Alberta with nuclear explosions. The plan actually received the endorsement of the Alberta government, but was rejected by the Government of Canada under Prime Minister John Diefenbaker. In addition to being opposed to having nuclear weapons in Canada, Diefenbaker was concerned that such a project would intensify Soviet espionage in Northern Canada. On May 7, a few weeks after the accident at Three-Mile Island, I was in Washington. I was there to refute some of that propaganda that Ralph Nader, Jane Fonda, and their kind are spewing to the news media in their attempt to frighten people away from nuclear power. I am 71 years old, and I was working 20 hours a day. The strain was too much. The next day, I suffered a heart attack. You might say that I was the only one whose health was affected by that reactor near Harrisburg. No, that would be wrong. It was not the reactor. It was Jane Fonda. Reactors are not dangerous. In the 1980s, Teller began a strong campaign for what was later called the Strategic Defense Initiative (SDI), derided by critics as "Star Wars," the concept of using lasers or satellites to destroy incoming Russian ICBMs. Teller lobbied with government agencies—and got the sanction of President Ronald Reagan—for his plan to develop a system using elaborate satellites which used atomic weapons to fire X-ray lasers at incoming missiles—as part of a broader scientific research program into defenses against nuclear weapons. However, scandal erupted when Teller (and his associate Lowell Wood) were accused of deliberately overselling the program and perhaps had encouraged the dismissal of a laboratory director (Roy Woodruff) who had attempted to correct the error. His claims led to a joke which circulated in the scientific community, that a new unit of unfounded optimism was designated as the teller; one teller was so large that most events had to be measured in nanotellers or picotellers. Many prominent scientists argued that the system was futile. Bethe, along with IBM physicist Richard Garwin and Cornell University colleague Kurt Gottfried, wrote an article in Scientific American which analyzed the system and concluded that any putative enemy could disable such a system by the use of suitable decoys. The project's funding was eventually scaled back. Many scientists opposed strategic defense on moral or political rather than purely technical grounds. They argued that, even if an effective system could be produced, it would undermine the system of Mutually Assured Destruction (MAD) that had prevented all-out war between the western democracies and the communist bloc. An effective defense, they contended, would make such a war "winnable" and, therefore, more likely. Despite (or perhaps because of) his hawkish reputation, Teller made a public point of noting that he regretted the use of the first atomic bombs on civilian cities during World War II. He further claimed that before the bombing of Hiroshima he had indeed lobbied Oppenheimer to use the weapons first in a "demonstration" which could be witnessed by the Japanese high-command and citizenry before using them to incur thousands of deaths. The "father of the hydrogen bomb" would use this quasi-anti-nuclear stance (he would say that he believed nuclear weapons to be unfortunate, but that the arms race was unavoidable due to the intractable nature of Communism) to promote technologies such as SDI, arguing that they were needed to make sure that nuclear weapons could never be used again (Better a Shield than a Sword was the title of one of his books on the subject). Our only hope is in getting the facts of our results before the people. This might help convince everybody the next war would be fatal. For this purpose, actual combat-use might even be the best thing. The historian Barton Bernstein argued that it is an "unconvincing claim" by Teller that he was a "covert dissenter" to the use of the weapon. In his 2001 Memoirs, Teller claims that he did lobby Oppenheimer, but that Oppenheimer had convinced him that he should take no action and that the scientists should leave military questions in the hands of the military; Teller claims he was not aware that Oppenheimer and other scientists were being consulted as to the actual use of the weapon and implies that Oppenheimer was being hypocritical. In his early career, Teller made contributions to nuclear and molecular physics, spectroscopy (the Jahn-Teller and Renner-Teller effects), and surface physics. His extension of Fermi's theory of beta decay (in the form of the so-called Gamow-Teller transitions) provided an important stepping stone in the applications of this theory. The Jahn-Teller effect and the BET theory have retained their original formulation and are still mainstays in physics and chemistry. Teller also made contributions to Thomas-Fermi theory, the precursor of density functional theory, a standard modern tool in the quantum mechanical treatment of complex molecules. In 1953, along with Nicholas Metropolis and Marshall Rosenbluth, Teller co-authored a paper which is a standard starting point for the applications of the Monte Carlo method to statistical mechanics. Teller's vigorous advocacy for strength through nuclear weapons, especially when so many of his wartime colleagues later expressed regret about the arms race, made him an easy target for the "mad scientist" stereotype (his accent and eyebrows certainly did not help shake the image). In 1991 he was awarded one of the first Ig Nobel Prizes for Peace in recognition of his "lifelong efforts to change the meaning of peace as we know it." He was also rumored to be the inspiration for the character of Dr. Strangelove in Stanley Kubrick's 1964 satirical film of the same name (other inspirations have been speculated to be RAND theorist Herman Kahn, rocket scientist Wernher von Braun, and Secretary of Defense Robert McNamara). 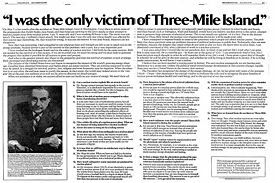 In the aforementioned Scientific American interview from 1999, he was reported as having bristled at the question: "My name is not Strangelove. I don't know about Strangelove. I'm not interested in Strangelove. What else can I say? …Look. Say it three times more, and I throw you out of this office." Nobel Prize winning physicist, Isidor I. Rabi, once suggested that "It would have been a better world without Teller." In addition, Teller's false claims that Stanislaw Ulam made no significant contribution to the development of the hydrogen bomb (despite Ulam's key insights of using compression and staging elements to generate the thermonuclear reaction) and his vicious personal attacks on Oppenheimer caused even greater animosity within the general physics community towards Teller. Teller was the subject of a song by the band Bad Religion titled, "The Biggest Killer in American History," which contains the lyrics, "I think of Edward Teller and his moribund reprise, then I look to Nevada and I can't believe my eyes. It's time for him to die." Teller died in Stanford, California, on September 9, 2003. In 1986, he was awarded the United States Military Academy's Sylvanus Thayer Award. He was a fellow of the American Academy of Arts and Sciences, the American Association for the Advancement of Science, and the American Nuclear Society. Among the honors he received were the Albert Einstein Award, the Enrico Fermi Award, and the National Medal of Science. He was also named as part of the group of "U.S. Scientists" who were Time magazine's People of the Year in 1960, and an asteroid, 5006 Teller, is named after him. He was awarded with the Presidential Medal of Freedom by President George W. Bush less than two months before his death. 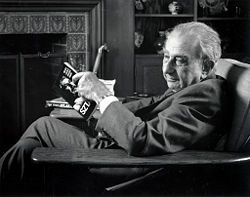 ↑ People Archive, Interview with Edward Teller, part 40. Retrieved November 17, 2007. ↑ Rhodes, 1995.; Herken, 2002. ↑ Collin Hughes, The Real Edward Teller? Logosonline. Retrieved November 17, 2007. ↑ Richard Rhodes, Dark Sun: The Making of the Hydrogen Bomb (New York: Simon and Schuster, ISBN 068480400X). ↑ 6.0 6.1 Gary Stix, Infamy and honor at the Atomic Café: Edward Teller has no regrets about his contentious career, Scientific American (1999). ↑ Hans Bethe, Testimony in the Matter of J. Robert Oppenheimer, Atomic Archive. Retrieved November 17, 2007. ↑ 8.0 8.1 Rhodes, 1995. ↑ Khariton and Smirnov, 1993. ↑ Soshichi Uchii, Review of Edward Teller's Memoirs, PHS Newsletter. Retrieved November 17, 2007. ↑ 12.0 12.1 12.2 Edward Teller, Testimony in the Matter of J. Robert Oppenheimer, PBS. Retrieved November 17, 2007. ↑ Steven Shapin, Megaton Man, The London Review of Books. Retrieved November 17, 2007. ↑ 14.0 14.1 Priscilla McMillan, The Ruin of J. Robert Oppenheimer and The Birth of the Arms Race (New York: Viking. ISBN 0670034223). ↑ 15.0 15.1 15.2 Teller, 2001. 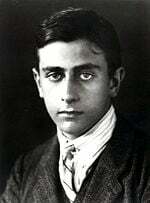 ↑ University of California Davis, Hertz Foundation Makes $1 Million Endowment in Honor of Edward Teller 1999. Retrieved November 17, 2007. ↑ Frank Loreto, Review of Nuclear Dynamite, CM Magazine. Retrieved November 17, 2007. ↑ 19.0 19.1 Broad, 1992. ↑ Edward Teller, Better a Shield than a Sword: Perspectives on Defense and Technology (New York: The Free Press, 1987, ISBN 0029324610). ↑ Essay Review, From the A-Bomb to Star Wars: Edward Teller's History. Better A Shield Than a Sword: Perspectives on Defense and Technology, Technology and Culture, 31(4): 848. Broad, William J. 1992. Teller’s War: The Top-Secret Story Behind the Star Wars Deception. New York: Simon & Schuster. ISBN 0671701061. Herken, Gregg. 2002. Brotherhood of the Bomb: The Tangled Lives and Loyalties of Robert Oppenheimer, Ernest Lawrence, and Edward Teller. New York: Henry Holt. ISBN 0805065881. O'Neill, Dan. 1994. The Firecracker Boys. New York: St. Martin’s Press. ISBN 0312110863. Rhodes, Richard. 1995. Dark Sun: The Making of the Hydrogen Bomb. New York: Simon and Schuster. ISBN 9780684804002. Teller, Edward, with Judith L. Shoolery. 2001. Memoirs: A Twentieth-Century Journey in Science and Politics. Cambridge, MA: Perseus Publishing. ISBN 073820532X. Powers, Thomas, "An American Tragedy," New York Review of Books, September 2005. Review of several revisionist histories of the struggles to develop the atomic and hydrogen bombs. "The Nuclear Legacy of Project Chariot"—includes a discussion of Teller's role. 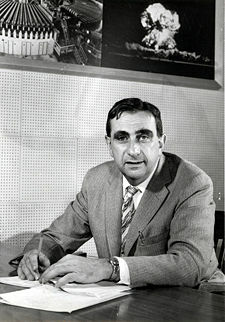 Annotated bibliography for Edward Teller from the Alsos Digital Library for Nuclear Issues. This page was last modified on 21 September 2017, at 15:50.